You know how there are cupcake bakeries (and now like doughnut ones too)? I sort of have a dream of having a cookie bakery. And by dream I mean...it sounds great in theory but then when I think about the amount of work, and the business stuffs, and being someone's boss....ugh. But I love the idea of baking and selling people cookies! Why can't life just be simple like that, hm? Anyway, this comes up because these cookies would be PERFECT to sell at a cookie bakery. They're big, they're chewy, they're full of yummy deliciousness, they're sturdy, and-oh yeah-they're pretty! 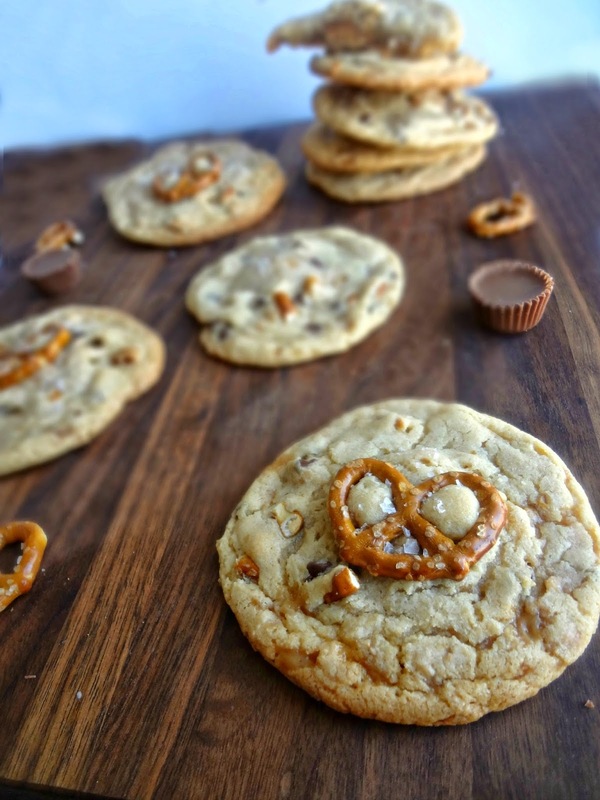 Look at those cute little pretzels on top of cookies! Adorbs. Heck, they're lovely even sans pretzel. (Because that pretzel is, in fact, entirely optional.) What is not optional, however, is the salt. I mean...I guess it is. But...cmon...haven't you realized by now how MIRACULOUS sea salt sprinkled on cookies is??! IT'S WONDEROUS! 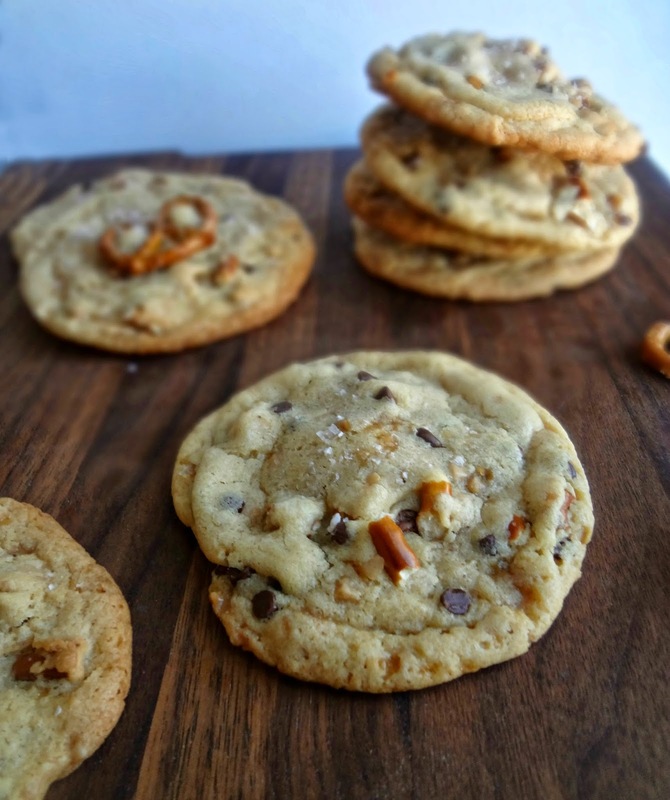 Anyway, let me break down this explosion of cookie deliciousness right heeere: browned butter. 2 sticks of it. Mandatory. Lots of toffee bits (I'm obsessed with toffee lately). Maybe some chocolate chips (if your toffee bits are naked-AKA sans chocolate-as mine were). Some little chopped up pieces of salty pretzels. Oh and a peanut butter cup surprise stuffed in the middle. And sea salt sprinkled on top of all 'o' that. It's like a taste-bud adventure. Each bite of this cookie is completely new and different, and awesome! 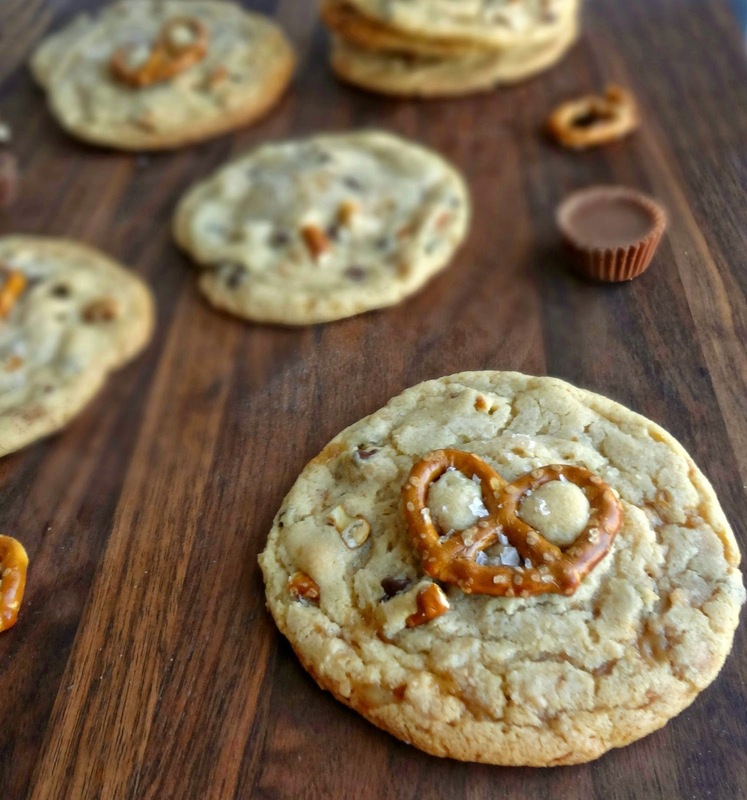 Michael and I both agree that the pb cup is really not necessary-but then, we're sort of on a kick where browned butter and toffee and salt are really all we need in a cookie. We need to force variety upon ourselves, however, and the pb cups ARE a tasty little treat inside. I am guilty of eating a minimum of 3 of these cookies for every day that we had them, until they ran out. ....my plan to not be fat for my wedding is not off to a great start. Preheat oven to 350F degrees. Line 2 large cookie sheets (or just 1 that you'll re-use in 2 batches) with parchment paper or silicone baking mat(s). To brown the butter: In a (preferably light colored) saucepan, melt 2 sticks of butter over medium heat, whisking as it melts, foams, bubbles, and eventually little brown bits form and it turns amber. Immediately pour into a large, heatproof, bowl. Using a stand or hand mixer, beat the peanut butter, vanilla, and sugars into the butter for about 3 minutes-until lightened. Beat in eggs for about 30 seconds, will not be fully incorporated. 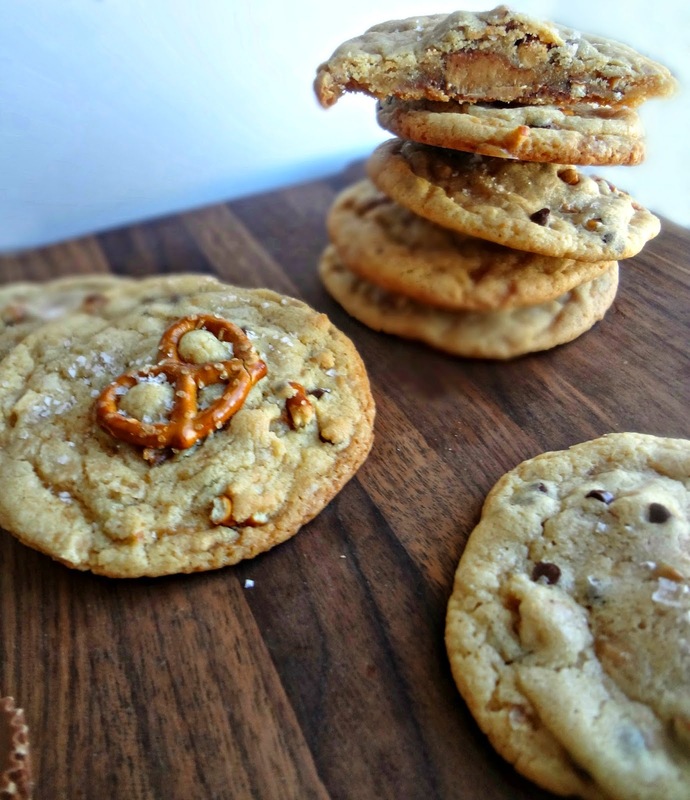 Stir in the chopped pretzels, toffee bits, and (if using) chocolate chips until evenly distributed amongst the dough. Scoop out 2 tbsp. ball of dough and place on baking sheet. Press a peanut butter cup in the center. Top with another 2 tbsp. scoop of dough, press the dough around, sealing the edges together. 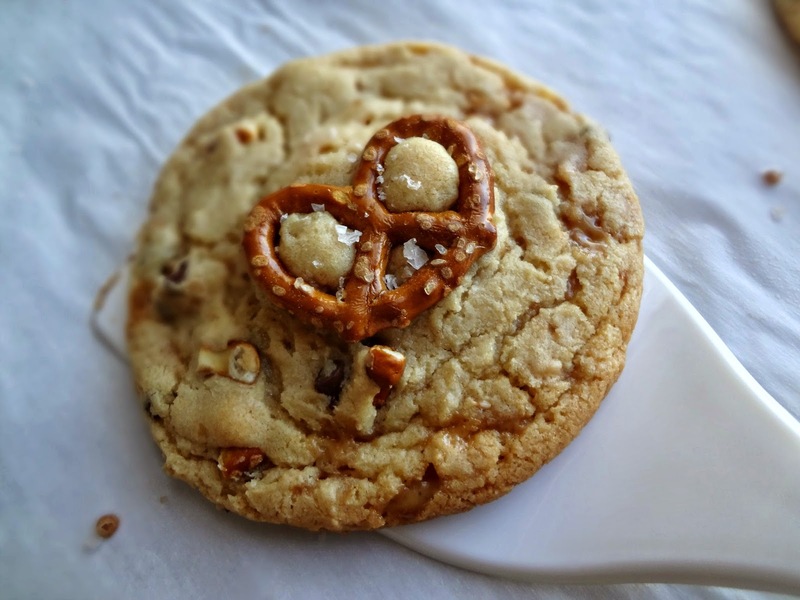 If desired, press a pretzel into the top of the cookie. Sprinkle with sea salt. Repeat until the baking sheet is full (leave about 2 in. between each cookie dough ball--I was able to fit about 12 cookies to a large baking sheet). Bake 15-18 minutes, until golden around the edges (if baking 2 sheets at once, be sure to rotate the pans for even baking). Remove and, if desired, sprinkle with more sea salt. Allow to cool on the sheet for 5 minutes. Then, transfer cookies to a wire rack to cool completely. I could totally serve these in a bakery, RIGHT? !